Upgrade vCloud Automation Center components is the below order: virtual appliances, IaaS databases, and IaaS services. There is a different sequence and procedure for upgrading vCAC in distributed environment (Load balancers and multiple vCAC Appliances). 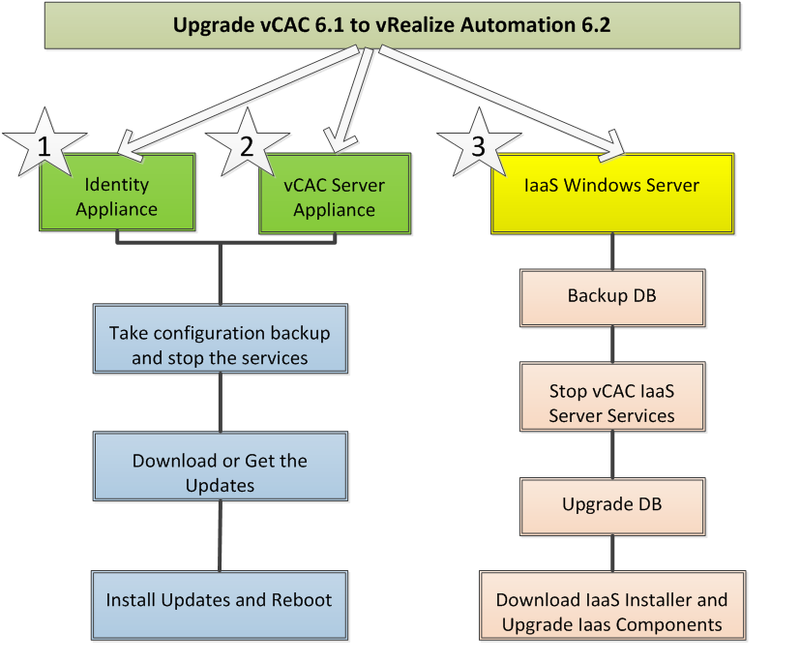 This post is about upgrading minimal vCAC deployment (which has single Identity Appliance, vCAC Appliance and IaaS Server). I am following the steps provided in the upgrade guide. 2. Verify that Microsoft Distributed Transaction Coordinator (MSDTC) is enabled on all vRealize Automation and associated SQL servers. 3. Back up vRealize Appliance configuration files in the following directories on each appliance. 4. Back up all databases. Create a snapshot of your virtual appliances and IaaS servers. 5. Shut Down vCloud Automation Center Services on Your IaaS Windows Server. 6. Backup "ovf-env.xml" located at "/opt/vmware/etc/vami"
1. If you are using vCloud Automation Center Designer, then uninstall it and install the 6.2 version after complete upgrade is done successfully. 2. If you are using external vCO or vRealize Orchestrator appliance and if it is connected to the Identity Appliance, then upgrade vRealize Orchestrator before you upgrade vRealize Automation. Shut down services on vCAC Appliance and IaaS Services. 1. Online VMware Repository - Requires internet connection to public Vmware repository. 2. Internal Repository - Zipped bundles needs to be manually downloaded from Vmware repository to your internal repository. In my case, I am using the option # 3. So, download the vRealize Automation Appliance 6.2.0 Update Repository Archive and VMware Identity Appliance for VMware vRealize Automation 6.2.0 Update Repository Archive for vCAC Server and ID Appliance respectively. a. Connect the CD-ROM drive for the virtual appliance you are updating to the ISO file you downloaded. b. Connect to vCAC ID Appliance @ port 5480 https://va-hostname.domain.name:5480.
c. Go to Update >> Settings, Under Update Repository, select Use CDROM Updates. Click save Settings. d. Now click on Status Tab and then click Check Updates to verify that if the mounted update is detected. e. Click Install Updates. Click OK to confirm that you want the update to proceed. d. After the update is installed, reboot the virtual appliance. ***Follow the same procedure for vCAC Server Appliance and make sure after reboot all the services are running. After upgrade you would notice couple of new tabs and Vmware vRealize Appliance instead of vCloud Automation center. b. Extract the contents of the DBUpgrade.zip archive file. With the elevated Windows command prompt, go to the respective file location. Note: .net 4.5.2 is supported for vRA 6.2, the download is available at https://vcac-va-hostname.domain.name:5480/i otherwise you are likely to get the error - MSB3073 while upgrading the DB. a. Open the browser and go to https://vcac-va-hostname.domain.name:5480/i and download "IaaS Installer"
Note: Do not change the file name. It is used to connect the installation to the vRealize Appliance. a. Start the IaaS setup installer and enter vCAC login details. b. Click on the Upgrade option and continue. c. Now the next page detects all the components which needs to be upgraded. Enter the Service Account and DB details. d. Now click on upgrade. It would take some time for replacing and upgrading all the components. e. Click on Finish after successful completion. This concludes the upgrade to vRealize Automation 6.2.
vCloud Automation Center branding remains on the console login page after you upgrade from vCloud Automation Center 6.1 to vRealize Automation 6.2. You can update your login console to use vRealize Automation branding. c. Enter the settings for your SSO Server. These settings must match the settings you entered when you configured your SSO appliance. d. Select Apply Branding and click on Save Settings. After couple of minutes, the branding is changed to vRealize Automation. Check the issues faced during this upgrade here. what all vmware products do you have in your environment, share the list with their current versions. action plan looks great to me, has it been tested by you or any one your known? I had the opportunity but as I wasn't using vCD, so I jumped on to the vRA 6.2 directly. if it's a big production environment then I would clone the respective VM to sandbox and with test networking run the product upgrade to see if it goes smooth. I have all of above products in my setup, if time permits I will upgrade vRA 6.2.1 which should be an easy one but I would follow the sequence and post my findings. "Distributed Execution Manager "DEM" cannot be upgraded because it points to Management Model Web host "https://IAAS_SERVER:443", which cannot be validated. " Since we have stopped DEM service on IAAS server as part of pre-requisite should i enable it back before IAAS upgrade. I can't find anything online. If someone faced similar error. Please help. Is it simple or distributed install ?